Those who know me, know that I’m a sucker for Sci-Fi and Fantasy stuff. Be it games, books, movies, if it falls under these two “categories”, I like it. It’s probably one of the major geek characteristics, still I don’t mind. The worlds depicted in sci-fi and fantasy are often interesting and complete to a degree that makes one wanting to explore and, some times, expand those universes. If there’s one universe that amazes me each passing day, for it’s story, characters and detail it’s the Halo Universe. Halo started as a game for the Xbox and PC but since then has evolved to a full fledged sci-fi universe, complete, detailed, with amazing characters and tales. Our tale, of humanity in the future. The games tell a story of decisive moments in the Halo Universe time line, but there’s much more information, the novels, the encyclopedia, the comics, loads and loads of information about this universe is told outside the games. 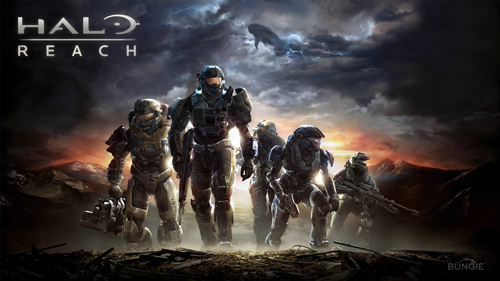 Next week, Halo Reach is coming out. It’s a very special game because of two key elements: it tells the tale of Noble Team and the demise of Reach and, we’ve been told that it’s the last Halo game developed by Bungie, the company that made all the previous Halo games. Although Reach is set before all the other Halo games and most fans already know the outcome, the story of Noble Team will be a heck of a ride. For what we’ve seen of Bungie’s work on the Halo series, Reach will definitely be Bungie’s “swan song”. …between saying and actually doing it…. time will tell.